The Licensing tool enables you to view the detailed license information, activate or de-activate a PowerServer, and update the license. After you purchase the product, you will need to activate PowerServer for permanent use. See the following flowchart for the activation process. The difference between PowerServer Web & PowerServer Mobile and PowerServer Web & Mobile is mainly the way of allocating the sessions/devices. For PowerServer Web & Mobile, Web apps and mobile apps can share the unused sessions/devices; while for PowerServer Web & PowerServer Mobile, the Web apps and the mobile apps are strictly limited by their own session counts. For example, if the Web session is set to 5, and the Mobile session is set to 10, then for PowerServer Web & PowerServer Mobile, the Web sessions cannot exceed 5 and the Mobile sessions cannot exceed 10, while for PowerServer Web & Mobile, so long as the total sessions do not exceed 15, the Web session can go over 5 if there are unused Mobile sessions, or the Mobile sessions can go over 10 if there are unused Web sessions. Application: it controls how many applications on this PowerServer can be accessed at a particular time. Session/Device: it controls how many sessions and/or devices can access the apps on this PowerServer at a particular time. For Web applications, each application instance running on the client is considered as one session, for mobile applications, each mobile device that is accessing the app (no matter how many apps) is considered as one device. You can specify the App ID Prefix when packaging the mobile project in the PowerServer Toolkit Package tool in PowerServer Toolkit User Guide. You can specify the Bundle ID when packaging the mobile project in the PowerServer Toolkit Package tool in PowerServer Toolkit User Guide. You should specify the consistent Bundle ID in the Xcode project for the same application. For details, refer to the section called “Task 3.1: Set Bundle Identifier” in PowerServer Mobile Tutorials. From the Server Type list, select Dedicated Server if the server is running on hardware that is dedicated for your use; select Azure Virtual Machine if the server is running on a virtual machine created in Windows Azure; select AWS Virtual Machine if the server is running on a virtual machine created in Amazon Web Services. When Azure Virtual Machine server type is selected, select the appropriate deployment model for the Azure virtual machine. Resource Manager VM -- You will need to provide the following information: Azure Subscription ID, Directory ID, Application ID, Key Value, and Virtual Machine Name. In order to get these information, you will need to first make configurations according to https://docs.microsoft.com/en-us/azure/azure-resource-manager/resource-group-create-service-principal-portal. Classic VM -- You will need to provide the following information: Azure Subscription ID, and Deployment Label. Upload Package -- You will need to provide the following information: Azure Subscription ID, and Deployment Label. You can get the information of Subscription ID and Deployment Name by selecting the proper service name from the Azure website portal. IMPORTANT: If Classic VM or Upload Package deployment model is selected, you will also need to log into the Azure administration portal (https://manage.windowsazure.com/), download the certificate file (https://manage.windowsazure.com/publishsettings), rename the file to credentials.publishsettings and copy the file to the local PowerServer installation directory \%appeon%\AEM\Cert. If the Cert folder does not exist, please manually create it. 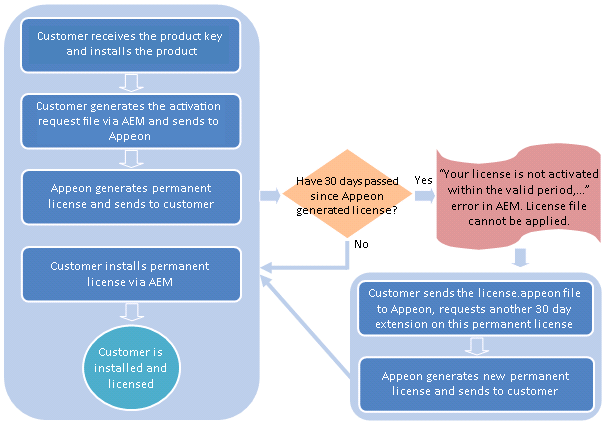 Please make sure you complete these steps before you apply the Appeon license file, and keep the certificate file exist in the specified directory whenever PowerServer is activated and running. When AWS Virtual Machine server type is selected, specify the settings for the server instance created in Amazon Web Services. These settings can be obtained from the AWS console. For detailed instructions, see AWS server instance settings. (Optional) Check the Is Virtual Machine checkbox, if the dedicated server is running on a virtual machine rather than a physical machine. 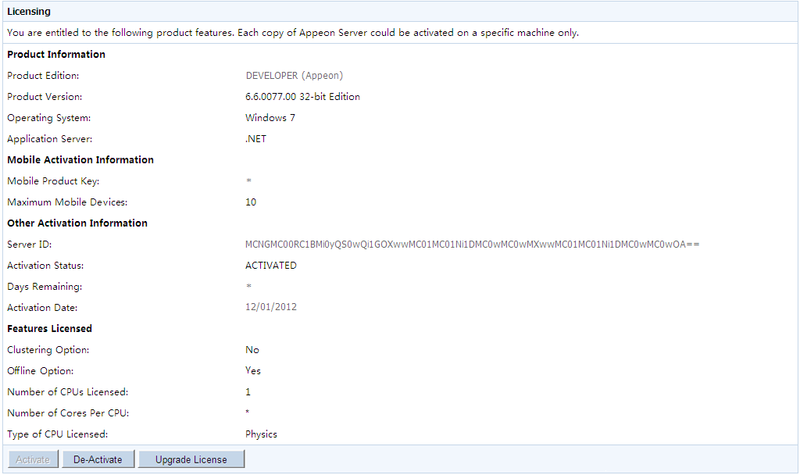 Click the Browse... button and select the license.appeon file. The file name must be exactly license.appeon, and it is case-sensitive. Click the Import button to import the license file. Please make sure the license file is imported successfully, and then restart PowerServer. 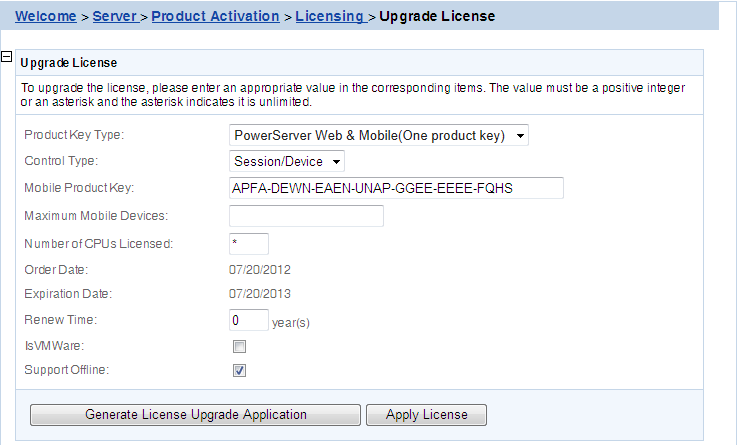 After you restart PowerServer, go back to the Licensing page, and verify that Activation Status is shown as Activated. Back up your permanent license file so you can use it again in case you will reinstall PowerServer within the 30-day install period. The information required for activating PowerServer on AWS includes: the region code of the account, the key ID and secret key of the user, the keyword prefix of the server instance, and the number of instances allowed for deploying PowerServer. All these information (except for the number of instances) can be obtained from the AWS console, as highlighted below. Region: the region code (NOT the region name) of the AWS account. To get the region code of the AWS account, first log into the AWS console and get the region name on the top right corner of your account center, then search the region name on the Web page: http://docs.aws.amazon.com/general/latest/gr/rande.html#apigateway_region to get the corresponding region code. Key ID: The access key ID of the AWS user. Secret Key: The access secret key of the AWS user. To get the access key ID and the access secret key of the AWS user, first log into the AWS console and go to the Users area. When you add a new user, be sure to select the Programmatic access type, and assign the user to the group with AmazonEC2ReadOnlyAccess permissions. After the user is added, you can get the access key ID and the access secret key. Keyword Prefix: A string that matches with the name prefix of the server instance(s) where PowerServer is deployed. There are two types of server instance where PowerServer can be deployed: Elastic Beanstalk(EB) and Amazon Elastic Compute Cloud(EC2). When creating an instance of Elastic Beanstalk(EB), the Environment name must start with the keyword prefix specified for the PowerServer license activation. For example, "Appeon" is the keyword prefix. 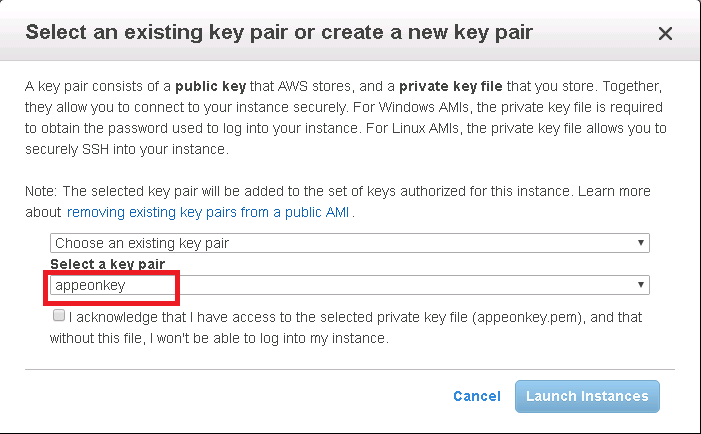 When creating an instance of Amazon Elastic Compute Cloud(EC2), the key pair must start with the keyword prefix specified for the PowerServer license activation. For example, "appeon" is the keyword prefix. After you create an instance (either Elastic Beanstalk(EB) or Amazon Elastic Compute Cloud(EC2)), you can modify the instance name. Make sure the prefix of the instance name matches with the keyword prefix specified for the PowerServer license activation. Numbers of Services: The maximum number of service instances allowed for deploying PowerServer under the current AWS account. Simply specify a number in the AEM page. Each copy of PowerServer can only be activated on one machine. If you want to activate a PowerServer on a different machine, you would need to de-activate PowerServer on the previous machine first and then activate it on the new machine, by following the instructions below. Step 1: De-activate PowerServer on the previous machine. You will be prompted by two sequential messages to confirm whether you want to deactivate PowerServer on this machine. IMPORTANT: Please be cautious with this action, as it is irreversible, and once you click OK, the license file will become invalid and can no longer be installed on this machine unless it is re-generated. Click OK to continue if you are sure to de-activate this PowerServer. Step 2: Generate the activation request for PowerServer on the new machine. 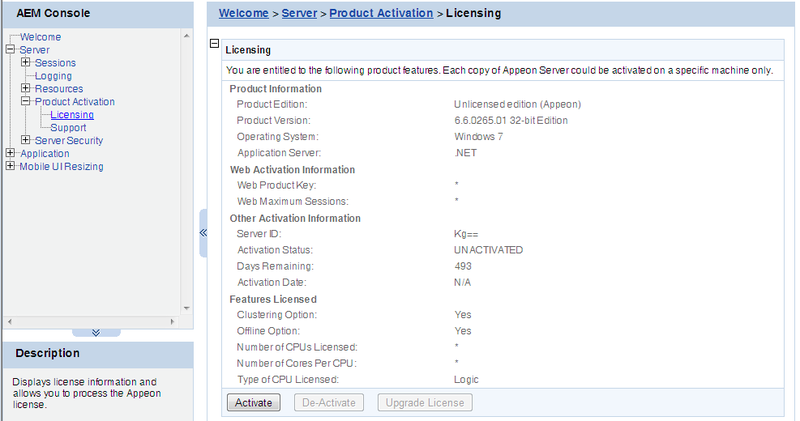 Step 6: Click the Browse... button and select the license.appeon file. Click the Import button to import the license file. Please make sure the license file is imported successfully, and then restart PowerServer. 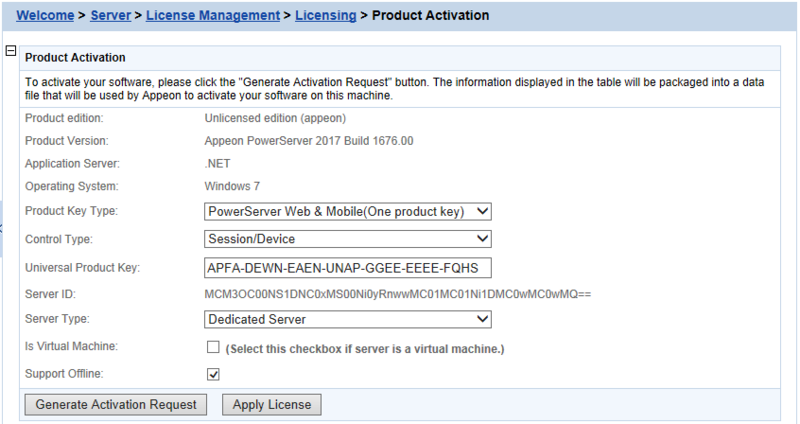 Step 7: After you restart PowerServer, go back to the Licensing page, and verify that the license information is updated, and the Activation Status is shown as Activated. Step 5 - Restart PowerServer after importing the license file, and go back to the Support page to ensure the support is correctly extended. What is PowerServer data source?